Graduate student Frank Ciaramello signs into one of the phones that he and professor Sheila Hemami created. 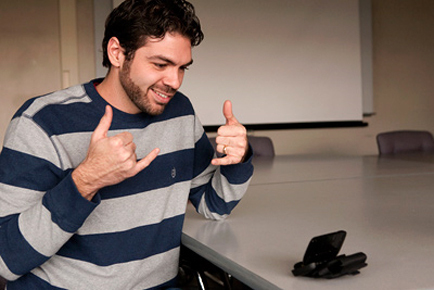 The cell phones allow deaf people to use sign language in real time. “Deaf people can text, but if texting were so fabulous, cell phones would never develop. There is a reason that we like to use our cell phones. People prefer to talk,” says Hemami. CORNELL (US)—New technology is allowing the deaf and hard of hearing to use cell phones the same way hearing people do—by talking. “We completely take cell phones for granted,” says Sheila Hemami, professor of electrical and computer engineering at Cornell University. Mobile ASL (American Sign Language) started four years ago and the first phone prototypes were created last year. They are now in the hands of about 25 deaf people in the Seattle area. The technology, Hemami says, is about much more than convenience. It allows deaf people “untethered communication in their native language,” exactly the same connectivity available to hearing people. Standard videoconferencing is used widely in academia and industry, for example, in distance-learning courses. But the Mobile ASL team designed their video compression software specifically with ASL users in mind, with the goal of sending clear, understandable video over existing limited bandwidth networks. They also faced such constraints as phones’ battery life and their ability to process real-time video at enough frames per second. They solved the battery life problem by writing software smart enough to vary the frames per second based on whether the user is signing or watching the other person sign. Because ASL requires efficient motion capture, the researchers had to make video compression software that could deliver video at about 10 frames per second. They also had to work within the standard wireless 2G network, which only allows transmission of video at about 15-20 kilobits per second. This is a relatively small amount of information when compared with a YouTube video, which travels at about 600 kilobits per second. For further comparison, high-definition digital television images come in at 6-10 megabits per second. The researchers studied how ASL developed for clues on how it is used, explains Frank Ciaramello, a graduate student working on the project. They learned that deaf people often use only one hand to sign, depending on the situation, they’re good at adapting as needed, and when two people are talking to each other, they spend almost the entire time focused on the other person’s face. “The facial expressions are really important in ASL, because they add a lot of information,” Ciaramello says. The researchers concluded that cell phone videos would have to be clearest in the face and hands, while they could spare some detail in the torso and in the background. Studies with deaf people who rated different videos on an intelligibility scale helped the researchers hone in on the best areas to focus in their video. The researchers are now perfecting their intelligibility metrics while also looking for ways to bring down the cost of integrating the software into the phones. Making the phones as user friendly as possible is a key goal of the project, Hemami says. Mobile ASL is funded by the National Science Foundation.